Amrit Gill, who owns the Hotel Blackhawk with his wife, Amy, visits with guests at Tuesday's celebration of the Davenport landmark's 100th anniversary. 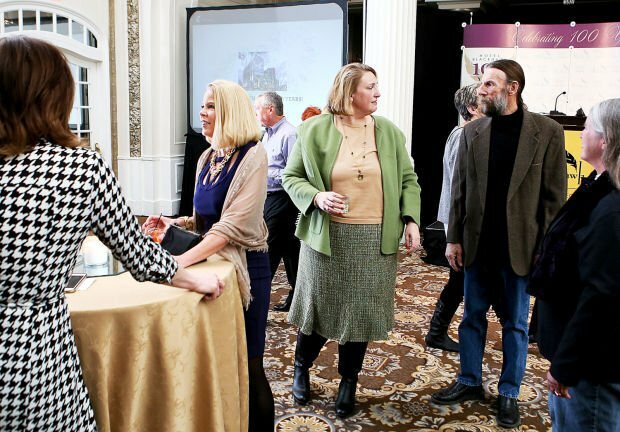 Amy Gill, center, who owns the Hotel Blackhawk with her husband, Amrit, visits with guests Tuesday at the beginning of a 100-year celebration for the hotel. Amrit Gill, center, who owns the Hotel Blackhawk with his wife, Amy, visits with guests Tuesday as the celebration of the hotel's 100th anniversary begins. Amy and Amrit Gill are interviewed Tuesday before a party to celebrate the 100th year of the Hotel Blackhawk in Davenport. 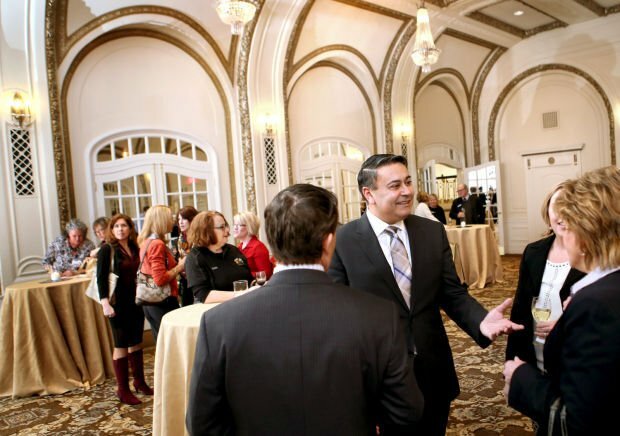 Guests mingle Tuesday during the 100th anniversary of the opening of the Hotel Blackhawk. Items from the Hotel Blackhawk's past. The Hotel Blackhawk reopened in December 2010 after undergoing a multimillion-dollar makeover. A Mardi Gras jester twirls a flaming baton in front of the Hotel Blackhawk in January 2011. Davenport has enjoyed the Hotel Blackhawk for most of the past century. Now the owners think it's time to export the brand. Amy and Amrit Gill announced plans Tuesday to open hotels with the "Hotel Blackhawk" name in four to five cities around the Midwest, including their hometown of St. Louis. "It really is a brand in and of itself," Amy Gill said. "It's a really unique place, and we'd like to continue that mission." Amrit Gill announced what he called the "Hotel Blackhawk Collection" and will be meeting with Marriott to discuss the brand. Hotel Blackhawk became part of the Marriott Autograph Collection of luxury hotels in 2013. "We believe the Blackhawk has a special place in the community's hearts and minds," he said. "We'd like to create that in other cities. We feel St. Louis deserves a Hotel Blackhawk." Besides St. Louis, where their Restoration St. Louis company is based and where they live, the Gills are traveling to other Midwest cities looking for buildings similar to the Davenport hotel: historic and with a downtown setting. The announcement came as part of the Hotel Blackhawk's birthday party. It turned 100 on Monday, but the couple intends to keep the celebration going all year with something new every month. The ongoing celebration will feature drinks that may have been ordered in 1915. Up for "The Shamble?" It's Rangpur lime gin with blackberry and lemon. There's even some local flavor with "When Bix Met Mary," a "revived" Bloody Mary with cucumber vodka, according to the drink list. Amy Gill said the cocktails and food menus will be changed throughout the year to reflect different decades over the past century. During the summer months, the hotel at 200 E. 3rd St. will show classic movies for free in the parking lot for the community to enjoy. Amy Gill said she hopes to make the hotel more accessible. "This is Davenport's dining room, Davenport's hotel," she added. Amrit Gill added that they may repeat an activity they tried on Father's Day last year, offering outdoor games for families in the parking lot. "Years from now, someone can say, 'I came here with my dad and played,'" he said. The yearlong celebration will culminate in a gala in November, the Gills said. They will keep updating the schedule on the hotel's Facebook page. Guests at Tuesday evening's birthday party included U.S. Rep. Dave Loebsack and Davenport Mayor Bill Gluba. "As you may recall, the closing of the Blackhawk years ago left a huge gap in our downtown," Gluba said. "It is so wonderful to see this majestic lady in her 100th year once again grace our skyline and be restored to the grandeur to which she was born." Gluba was referring to a fire on Feb. 11, 2006, that damaged the hotel's top floors. Officials later determined a meth operation caused the fire. Gluba said that since reopening under the Gills, the hotel has received a number of awards. Last month the Hotel Blackhawk was named the "Best Hotel in Iowa" by Business Insider. It also is one of three Iowa hotels to earn the Four Diamond Rating from AAA Minnesota/Iowa. "This is one more milestone in the transformation of the Hotel Blackhawk," said Quad-Cities Convention & Visitors Bureau president and CEO Joe Taylor. "It is now one of the nation's outstanding hotels." Amy Gill said she's always meeting someone new with a Hotel Blackhawk memory to share, whether it was getting married there or other special events. "We're on the third generation (of weddings) with some families," she added. "We love it. People wander through the hotel. I can't stand not knowing. I have to go up and talk to them. Some say they got married here 50 years ago." The seven-story Blackhawk Hotel, as it was known then, opened Feb. 16, 1915, mere weeks after Alexander Graham Bell made his famous first coast-to-coast telephone call. Four floors were added five years later. Its storied list of guests includes entertainers Cary Grant and Louis Armstrong and a handful of presidents, most recently Barack Obama. The president stayed there in 2011, just months after the historic landmark had been reopened under the Gills' ownership. The Gills were awarded $8.5 million in state historic tax credits to help pay for the $40 million renovation of the building, work that occurred in 2009-10. Amy Gill said the renovation and reopening of the hotel has "sparked a renaissance downtown." The renewal includes a few more completed Gill projects, such as the Forrest Block, The Renwick and now the Market Lofts, with 37 units that opened Jan. 3 in the downtown's Warehouse District. The Gills are also moving forward with plans for a major renovation of the Putnam and Parker buildings into a residential and commercial development called City Square. Recent and planned downtown projects by other developers include Riverwatch Place, a six-story multi-use building at the former Howard Johnson motel site; a four-story building on the longtime site of The Dock restaurant; the Scott County Family Y's Early Learning Center and a loft housing project in the former Union Arcade building. There also have also been several loft housing projects in the Warehouse District done by various developers.